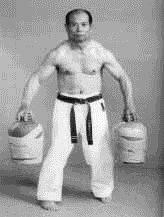 Franco Sanguinetti began his Budo training in 1972 in his homeland of Perú, he counts among his influences many traditional Japanese and Okinawan martial arts instructors, such as Morio Higaonna, Juichi Kokubo, John Roseberry, Shinpo Matayoshi, Gakiya Yoshiaki, and Seisho Itokazu. Sanguinetti Sensei holds the rank of 7th Degree Black Belt both in Okinawan Gōjū Ryu Karate and Matayoshi Kobudo (traditional Okinawan weapons). 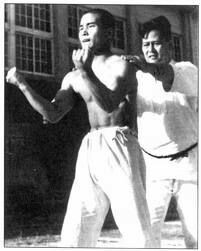 In 1982, he moved to Okinawa to train with Matayoshi Shinpo Sensei (1921-97). Sensei Sanguinetti is the founder and chief instructor of the Bushikan Budo Kyokai in San Marcos, CA. 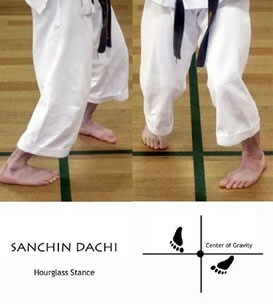 Sanchin Kata: Some say the meaning of sanchin relates to the three journeys of life: developing the body, mind, and spirit. Through regular physical training, practicing basic exercises and kata properly, one learns to develop the capabilities of the body. Later, through striving to understand the history and application of the martial arts, one develops the knowledge and creativity of the mind. Development of the spirit is the third and most important goal, seeking to bring the body and mind into harmony with each other and with the world. 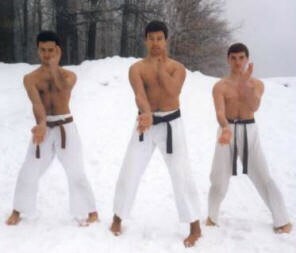 Diligent practice of the Sanchin kata allows the karateka to make progress on all three of these journeys.